My 2 yo has been super excited every time she sees paper mache so today we decided to try it. 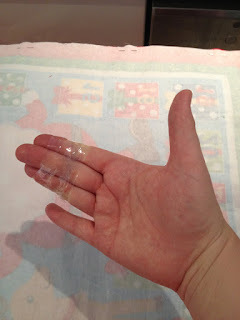 But with only a glue stick in the house, I had to make up some glue for the project. There are various recipes on the web but here is the one I used. 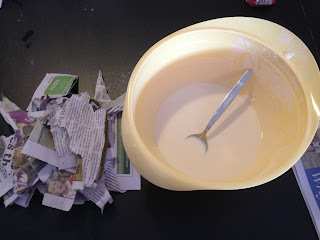 Ingredients: 1 cup plain flour1 cup water2 tablespoons of salt to preserve Method: Sift flour to help remove lumpsAdd water and stir until smoothAdd salt and stirThin with water if desired I just loved this glue! We made a mess but because it is just flour and water it is REALLY easy to clean up. The glue on my 2 yo's clothes dried up and flaked off. And glue spilt on the table cleaned up with water and a cloth. As parents we are always time poor and the idea of making anything that we can buy fairly cheaply from the shops seems like a time consuming hassle. But this is one thing that is really worth it for little kids. My eldest is now 2 years old and our activities are now encompassing cooking, science and art. I am constantly on the lookout for ideas and I'll be posting the good ones here. Today was our first foray into paint. Yes, very scary with a two year old, but this activity can be very controlled - well ... relatively speaking! 1. Fold paper in half and the open it again. 2. If your child is young, pour portions of paint into spoons. Older kids might be able to do this themselves.